Our world is filled with texture. For the human visual system, this is an important source of information for assessing environmental and material properties. 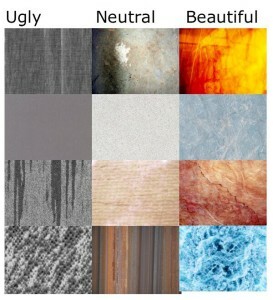 But can we also predict – what seem to be very personal – aesthetic judgments such as beauty based on the visual features of a texture? In this paper, which appeared in a special research topic on aesthetic preferences in the journal Frontiers in Human Neuroscience, Richard Jacobs and colleagues show that computed features of texture can be used to predict – with reasonable accuracy – perceived texture qualities—including their aesthetic appreciation. This indicates that aesthetic appreciation is much more universal than commonly thought, which is relevant from both a psychological and neuroscientific perspective, as well as from a more applied one such as in design, architecture, and the visual arts.